Oh, boy. We may not be having an awful lot of luck buying houses at the moment, but this week certainly made up for it. It just so happened that a brand new garden, one that rivals the world famous Jardin Majorelle, opened in Marrakech and we happened to quite literally stumble across it on its very first day. Oh, and then chat to its owner and project manager. That’s pretty lucky. The central, walled medina (old Arab quarter) of Marrakech is a series of tiny passageways, too narrow for a car, but just right for four or five lanes of bikes, scooters, motorbikes, donkeys, plus a couple for pedestrians and a market stall on either side. To an English country girl, it is mayhem. The passageways have high, windowless walls, protecting the houses within them, decoration reserved for inside. Hence the name, ‘Secret Garden’ and the incredible wow factor as you transition from the most built up city I had ever seen, to this tranquil, serene paradise. We walked around open mouthed. The site used to be the riad (house with central garden) of a nineteenth century Medina Governor, but originally dates back to the sixteenth century . Fallen into disrepair, a visionary took over the property and in some three years, transformed both architecture and green spaces, restoring it to its former beauty (and then some, I suspect). Before renovations began (you can see the same green roof in the photo above); what a transformation! When we spoke to the project manager, his passion for Morocco really shone through. Having lived here for 15 years, he knows the culture well and wanted to create something for the Moroccans. He wanted a large Islamic garden, reflecting the importance of green spaces as stated in the Quran and he wanted a second area, reflecting the experimental nature of Moroccans, to create something quite different. He spoke of the hard work and honesty of the workers, who made it all possible. It is hard to believe that this huge site was renovated using donkeys for transport. All the rubble being carted out at night whilst the streets were quiet. And to think that, in an earlier life, I had considered the logistics for building Terminal 2 in the middle of Heathrow Airport, a challenge. But they certainly didn’t let logistics get in the way of the final result. Commenced just three years ago, it is incredible the ambience they have created on day one. Le Jardin Secret is two interconnected gardens: an Islamic garden and an exotic garden. The larger, Islamic garden is divided into four quadrants in the traditional style, with a water feature in the centre. It is sufficiently generous for each quadrant to again be divided into four, each anchored with a further water feature, just as it likely existed in the eighteenth century. The Islamic section is filled with plants from the Mediterranean, North Africa and Persia, following strict geometric rules, in which ‘the Muslim order asserts itself over the wild disorder of nature’. Yet there was much fluidity in the garden, from the movement of the grasses to the plays of light and sound of water and the birds and bees, revelling amongst abundant citrus blossom. Despite selecting plants of local origin, Marrakech’s dry climate means that irrigation is still required. During restoration a large tank was uncovered and restored, along with gravity-fed rills that feed each bed. Indeed, heaven is described in the Quran as a ‘garden in which streams flow’ and water ‘represents a surface in which the soul can contemplate its reflection, enter its own world and purify itself’. Water is absolutely central. It is the simplicity and structure, complemented with this fluidity, that makes the garden so contemplative. It is perfectly balanced, holding your gaze, without over stimulation. Situated next to the crazy hubbub of the city, it almost forces you to reset your pace, making you stop and take a step back, re-evaluating what it’s all about. The exotic garden is a perfect companion: enough structure and common threads in the hard landscaping to connect the two, whilst adding a whole new dimension. It contains plants from all over the world – I think I counted six continents – and yet the planting hangs together as if a frequently seen combination. Texture and form are the two features that stand out in this garden, unlike colour, in so many others. But the garden maintains a lush, soft feel, so hard to achieve with dry climate plants. There are similarities to the Jardin Majorelle and yet it is entirely unique, too. The hard landscaping is more authentic and traditional and colours, whilst bold, more subtle, yet equally effective. It is perhaps a little more sophisticated and yet not in a way that equals boring, as can so often be the way. Yellow Bulbine frutescens looks magical next to Agave attenuata, one of Sydney’s most common plants. So why haven’t I seen (or indeed used myself!) this combination before? The only disappointing thing about this garden was who designed it. I immediately wanted to find out who the local designer was, to do what I could to make him or her a hero, to meet them if possible. This was outstanding garden design. And then I heard. It was Tom Stuart-Smith, the eight times Chelsea gold medal winner, from London. Paul couldn’t understand why this was so disappointing. I just couldn’t believe that having stumbling across something I loved, in Morocco of all places, it had to be a famous English designer. I guess I hoped it was a sign of widening talent, a sign of spreading world class gardens. I felt disappointed that this local garden wasn’t locally inspired. I could almost be tempted to use mature plants in future gardens after seeing this! The project manager explained that it wasn’t for want of trying. But to have a vision, set down on paper from the start, was not the way of local designers. With such an aspirational, long term and expensive project, the risks were too high to operate in any other way. I had to reluctantly agree. But this wonderful garden, so serene, so connected to its history, yet with a contemporary twist making it so appealing, should indeed be celebrated to the highest degree. Paul has created a page for its first TripAdvisor review, I’m more than happy to reiterate (if not make) Tom Stuart-Smith’s heroicness and there is one other blessing in disguise. Tom Stuart-Smith has recently been appointed designer for the new RHS Bridgewater garden, near Manchester, that opens in 2019. So if I can contain my excitement long enough, I’m quite certain we have another huge treat in store! Wasn’t I lucky to see it? We almost went back a second time but rain kept us away on our last morning! Now that one I could definitely live with. I love the softer planting and the way it contrasts with the bold outlines of the cacti and agaves. I suppose, given the designer, that is to be expected, a real fusion of cultural styles. But it so works doesn’t it? It would be very interesting to revisit it in a year or two and see how it has fared. I hope there is better news on the househunting front, soon! Yes, very liveable. And it takes a very clever designer to be able to make something work so well in such an alien place. Maybe you could do the honours in a couple of years’ time and report back?! Off to see more houses tomorrow, fingers crossed! We’ve offered on two, hoping for third time lucky. 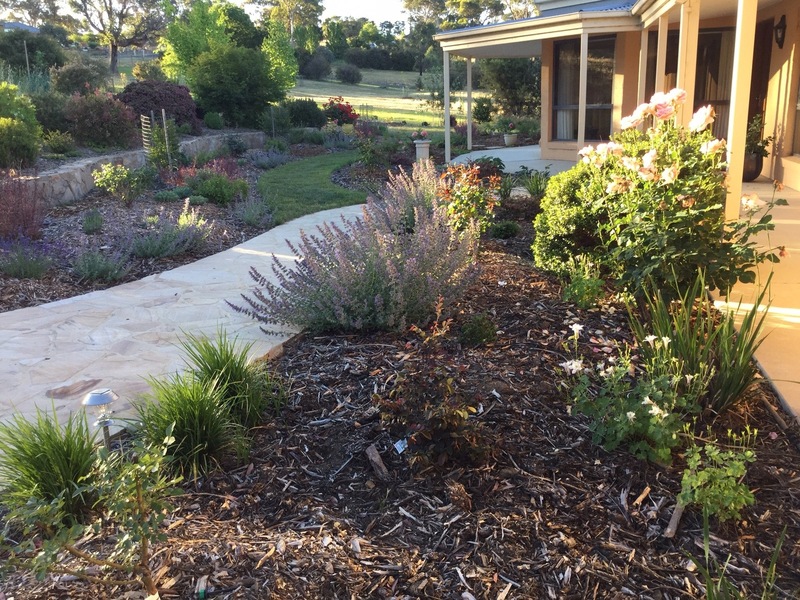 From the first few photos I thought – there is an Australian influence here, the use of Stipa being so reminiscent of our roadside plantings (normally Lomandra cultivars) and then I thought, no there is a European hand at play with the purples and so on. Then no, no, it’s a Mediterranean designer. So it come as no surprise that this garden was designed by the redoubtable Tom Stuart-Smith. Very clever and I love the grasses combined with the olive trees because at one point I did start to think – it is so hot there, where are the trees to turn this into an enjoyable oasis? What excites me even more? I never know where you will be next Janna! It really does have a bit of everything, doesn’t it? I guess that is what an extremely experienced designer is able to do. I need to spend two or three years in each city to really absorb it and find my style but TS-S is seemingly able to do it on the spot! When you look at the drawings on Tom’s website, it looks very different (and very beautiful) with mature trees; worth a look. Oh, and just looking into my next trip now! What a huge stroke of luck to find this one, Janna! From the photos I like it better than than the Jardin Marjorelle, and it will get even better of course as the tree and palm canopy matures. Lovely pics as usual! We wondered whether we felt more for it than Jardin Majorelle because it was new, quiet, we met the owner and being such a surprise, had a lot of excitement/novelty value around it. But I think it genuinely is more to my taste, although I do still love the other one. 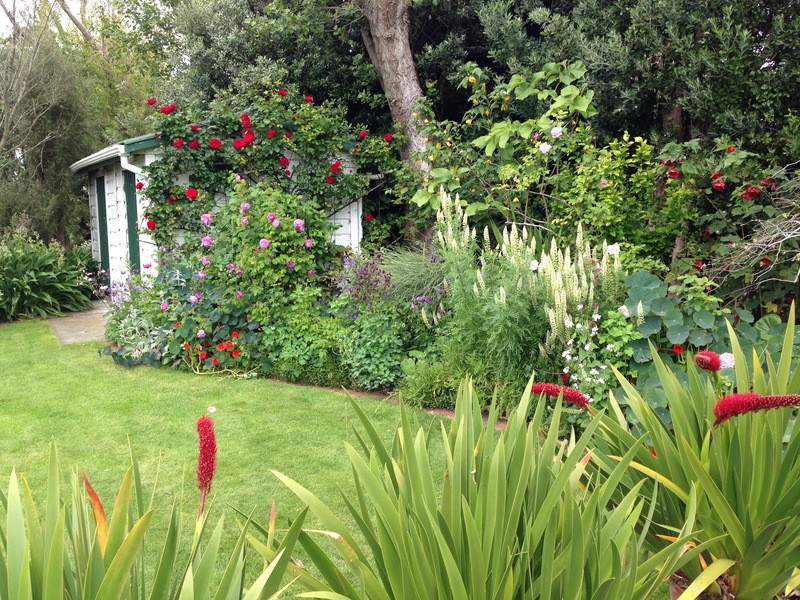 What an incredible renovation of a garden, I’m glad you included the ”before” photo! I loved the soft grey colours, very similar to some in Australia…and then the deep purples and greens. Quite inspirational, especially considering our similarly dry climate. I wonder how they manage for water? It is inspiring, isn’t it? So much we could ‘borrow’ and use in Australia. I love seeing before photos too as I think it gives us all hope! The irrigation was very well documented in signs around the garden. Essentially the water comes off the Atlas Mountains and is then fed into the city. Because this was the previous residence of the Governor of the Medina, it probably had one of the largest feeds, along with extensive systems throughout the site. Fundamentally though, they have a Snowy Mountains Hydro Scheme! Another very inspirational Jardin Janna. I don’t think I will ever complain about my hot summers or dry weather again (I won’t make that a promise) after seeing what can be done in such a harsh environment. I wonder how the stipa will stand up to a sizzling summer? By next summer they’ll be getting soon shelter from elegant palm fronds but it still must be VERY hot. Beautiful gardens really are about using the right type of plants for the right place. I’m still not a fan of cacti but both Jardins gain the most amazing structure and textures from them. I love the colours used here, bold but not ‘in your face’ and the traditional green Morrican roof tiles are beautiful. Why don’t we use them here? Dark grey roofs are all the rage at the moment…so hot and heavy looking…and ugly. All the best for your house hunting AND those assignments. No, that sounds a dodgy promise to make! It was funny how the locals were with the cold; 21 degrees and they were in coats and scarves with all sorts of complaining. We thought it was beautiful weather! Completely agree with you on the ‘bold but not in your face’ colours; they have been perfectly chosen, haven’t they? And as for the ‘right plant, right place’, I wonder if you can get hold of the book I am currently reading. It’s called ‘Planting in a post-wild world’ by Rainer and West. It seems to join up and perfectly articulate all my random thoughts; an absolute joy to read, although annoyingly I’m on about a page a day at the moment! Would love to know your thoughts on it and how it could be translated to Australia (it is US focussed). I shall try to source the book. Had a look on google for an overview. It sounds very interesting. I’ll let you know how I go. Excellent. I do warn you that is is very cool climate focussed, but I so passionately agree with their key points (which are applicable anywhere) and I am certain it will make you think, which I know you love! It is crying out for someone to apply it to warmer climes. Unfortunately the book ls not available in the WA library system as yet. It may be later in the year. I haven’t given up yet. It does sound like my ‘sort of thing’ cold climate or not. Thanks for sharing. I just bought a riad by this new garden last summer. So excited to get back as see it now that it is open. How exciting! I am sure you are going to absolutely love the garden. It is such a very, very special place. I hope you are able to get back soon. Let me know what you think! I will be there the first week of May. I will let you know! Two weeks until we go back to Marrakech (my third visit) and this garden is now firmly on my list of things to do whilst Him Indoors sits by a pool. Wonderful write-up, I doubt I can compete, but it will be interesting to see what the garden looks like in late September. Hopefully not too frazzled, which is precisely how I feel! Oh, you lucky, lucky thing! You’ll love the plants there; such a happy mix of unusual species. It will be interesting to see if it has filled out much over the summer, although I think the combination of good plant selection and amazing attention to detail on the maintenance will mean it has survived the heat well. Hope you come back much less frazzled! You seem to have had a very busy summer. This year has been a complete one-off. At least I hope so! We are actively clearing next year of unnecessary obligations (including opening the garden) so that we can take our lives back, enjoy the new house and see more of our friends. Can’t wait! That sounds like an exceptionally good (and much needed) plan!